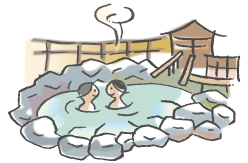 There are ten kinds of baths and can take a bath with a choice of effect. There is Western-style open-air bath SPA pool, too, and function of health up is fulfilling, too. July, 1986 nation health hot spring resort designation.